I’ve been playing role-playing games for more than a decade. While I started role-playing with the revised edition of AD&D 2E, most of my gaming time has been spent running campaigns in D&D 3.X and 4E. 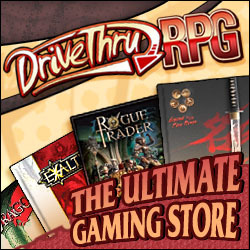 Over the years, I’ve picked up a fair number of other RPGs, but have never really managed to play most of them because I’ve been busy running D&D campaigns. At the beginning of this year, I decided that it was time for that to change and set a goal of playing some of those games from my backlog as well as some new games I was planning to purchase throughout the year. I’ve managed to try a couple new games during the year. I ran one of the Dragon Age adventures from Blood in Ferelden that was a lot of fun despite ending in a TPK. I also got to play in a game of Leverage at Epic Game Day. Both times it was a lot of fun to take a break from D&D and the d20 system to try out something new. Only managing to play 2 new games in more than half a year wasn’t enough for me. Especially considering that I had probably bought a half dozen new games in that time frame. I needed to do something more drastic if I was going to make any progress on my backlog of games to try. When I gave my regular D&D group the option of trying out a new game or continuing our current campaign, they voted unanimously to keep playing D&D. While that means I must be doing an okay job as a DM, it also means that I’ve had to come up with an alternate way to try out other games. To that end, I’ve put together a game-of-the-month group. My plan is to have a small pool of players and each month run one or two sessions in a new game. Having a pool of potential players and a commitment of just 1-2 sessions at a time should help make scheduling easy and allow people to pass on games that they are either not interested in or too busy to play. Around the time I came up with the idea for a game-of-the-month group, Thadeous asked if I would be interested in writing a column for This is My Game. I debated a few topics, but ended up deciding that a column chronicling my experiences running a different game each month would be the best choice. I’m not really planning to write the columns as reviews of the games that we play, but instead I’ll focus on what parts of the games work particularly well or have notable problems. Based on what the players and myself like about a game, I’ll look at ways to either use the good ideas in other games or consider some ideas for patching the rough spots. My hope is that even if you aren’t inspired to try a new game (or don’t have the time or people needed to do so), you can get something useful out of the posts to apply to whatever game you’re currently playing. For the first game-of-the-month session, I’m going to be running Basic D&D (the 1981 box by Tom Moldvay). It’s the oldest game that I have on my shelf (older than I am in fact) and felt like a natural place to start a tour of role-playing games. Be sure to stop by next month to read about how it goes.